When I was about 8 years old I was done with Disney, done with PBS, even done with Cartoon Network. I didn’t want to be a kid anymore, I wanted to be treated like an adult; I wanted to go to bed later than 8:30, I wanted to go trick or treating all by myself, I wanted to dress myself! My parents didn’t understand. They still don’t understand, but they can’t tell me who to be anymore. I was a little rebel, still am one too! Example? One night I wanted to stay up all night long, so I did that; at the time I was new to the IFC (Independent Film Channel). On Fridays from about 12-3 they showed films that were kind of . . . out there. I flipped to the channel while it was in the middle of a film. At the time I did not have a little TV guide that popped up and told me what I was watching. On my old TV when you went to a channel it was black for about five seconds, then the picture showed up. I will never forget what I saw: three kids were sitting in a really dirty living room huffing what looked like spray paint. This little kid was running around the place, having the time of his life. He knocked a photo off the wall making a big old pack of bugs crawl out from behind. All of a sudden flashing images of an albino girl dancing to rap music came up, she started talking about her love life, what kind of guy she wants. I was freaked out, I have never seen anything so random yet creepy before in my life. I turned off the TV and went to bed. After that I would always think about the film, wondering what the name was. Last year in ICT, I was on IMDB looking at a guy’s list of favorite directors. A name came up, a name I had never heard of before. The name was Harmony Korine; I clicked on his page and scrolled down to see what films he had made. 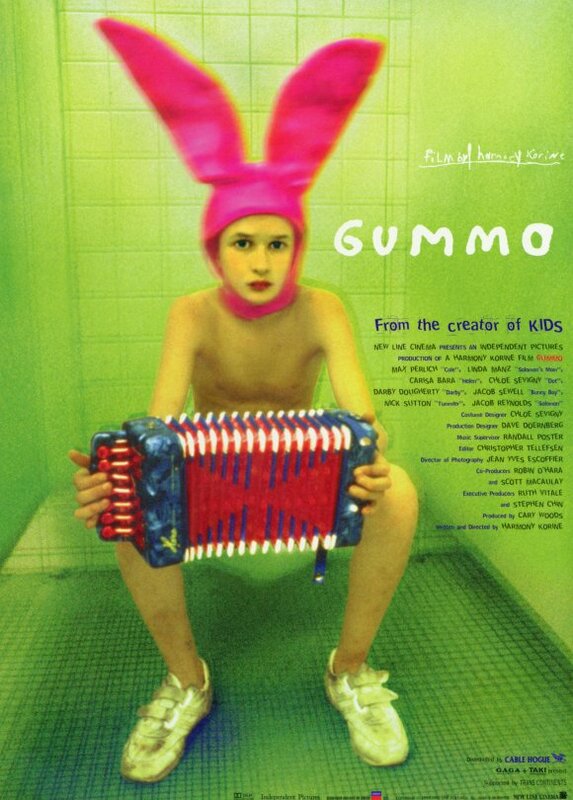 I came across a film called Gummo, the most famous from him. I clicked on it and guess what? The first picture I see is a bunch of kids sitting in a living room, huffing some paint. I found it; the film I had been looking for, for so long! I went home and the first thing I did was look this movie up. I watched every trailer made for it, saw every photo taken of it; even read reviews from critics. It was said to be very different, something that most people have never seen before. I was sold; I looked it up on Netflix, rented it, and put it on the top of my list. I waited a week for it to come, one Monday (had no school that Monday) I checked the mail . . . and there it was. I canceled all my plans just to watch this movie. I made some food, got some soda, and threw it in! Only an hour and a half later . . . it was over. I sat there not even knowing what I watched. So I waited for my brother to come home, and I showed it to him. After we watched it, we talked about it, trying to break it all down. “This film feels like a picture book,” my brother said. Smartest thing the man has said; I realized all it was was a movie with characters. It put the characters in different situations and had them talk about different things. After I realized all of this I watched the movie one more time before I sent it back. I like this film a lot, it is very different; you can’t really compare it to anything. Harmony Korine has a very different way of storytelling; it really shines through in this film. He really puts us in with these people. We follow around Solomon and Tummler, who ride around on their bikes and kill cats for the owner of the local hardware store. They use their money to buy paint and huff it. Tummler gets a lot of girls: at the start of the film he is making out with a girl and feels that she has a lump in her breast (she later finds out she has breast cancer). Tummler is funny looking, tall, long greasy brown hair, and is way too skinny. Solomon thinks Tummler is the bee’s knees, the “greatest guy” he has ever met. Solomon does everything Tummler tells him to do; yet Tummler isn’t mean to him, he is like an older brother to Solomon. That’s why he has so much respect for the guy. This film shows Solomon and Tummler with their families a lot. Their parents are living, breathing characters (unlike most films). This movie also follows around Bunny Boy, who doesn’t talk much. But she gets in a bit of a fight with some potty mouth kids. I can’t explain this whole film to you, it would take way too long. This film made me realize that you don’t always need a “plot”; films can be more human, and have life to them. Just show people doing what they do every day. That’s what I enjoy about Harmony’s movies, they feel so human. Go watch this film and see what I’m talking about. It’s not for everyone (due to some subject matter), but this is really the kind of style I want to shoot my films in.